Browse below for dog friendly pubs in Keswick. Situated in the centre of Keswick, The George is the town’s oldest coaching Inn built in 1665. The impression of the 350-year history of the Inn is indisputable, in the heavily beamed rooms it retains all of the character you would expect from this popular Inn. 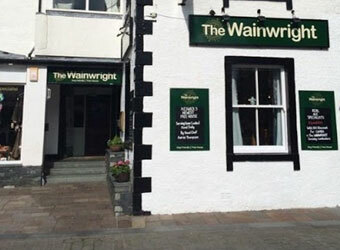 The Wainwright is a traditional pub on Lake Road in Keswick town centre. The pub is dog friendly, having oak floors throughout, and provides a relaxing atmosphere for the casual tourist as well as the committed user of the Fells. The Kings Arms Hotel is centrally located in Keswick making it the ideal base for exploring the area with your dog. This family owned hotel has 13 en-suite bedrooms, serves delicious locally-sourced food and offers a wide selection of real ales and whiskies.